On battlefields from Virginia to Louisiana, the soldiers of Connecticut’s Ninth Regiment Volunteer Infantry marched into combat against Confederate forces under a regimental flag unlike any other from the state: a blue banner emblazoned with a golden harp on a field of emerald green dotted with shamrocks and bearing the motto “Erin Go Bragh.” The symbols and the slogan proclaimed the unit as Connecticut’s “Irish Regiment,” composed of 1,200 first- and second-generation Irish for whom fighting to preserve the Union was a demonstration of their loyalty to an adopted land that had more often than not treated them as second-class citizens. Irish immigrants began arriving in Connecticut in significant numbers in the 1840s. Most were desperately poor refugees from the potato famine devastating their homeland. These largely illiterate newcomers were not warmly welcomed to the new land, especially because an overwhelmingly Protestant Connecticut viewed the Irish immigrants’ Roman Catholic faith with suspicious hostility. The Irish found work at the state’s labor-hungry quarries and railroad construction sites. And they continued to come to Connecticut in a steady stream that by 1860 had swollen the number of Irish immigrants in the state to more than 50,000. They established their own churches, became American citizens, and participated in politics. Even as their numbers increased, the Irish encountered prejudice and discrimination. State laws were enacted to hamper their efforts to attain citizenship and to vote. In 1855, the governor of Connecticut disbanded six state militia units made up of Irish immigrants, even though most were naturalized US citizens. The Irish militia, being “composed entirely of the foreign born,” would be “detrimental to the military interests of our state,” the governor claimed. Connecticut’s Irish Regiment engaged the enemy rebels a total of 11 times in Virginia and Louisiana. 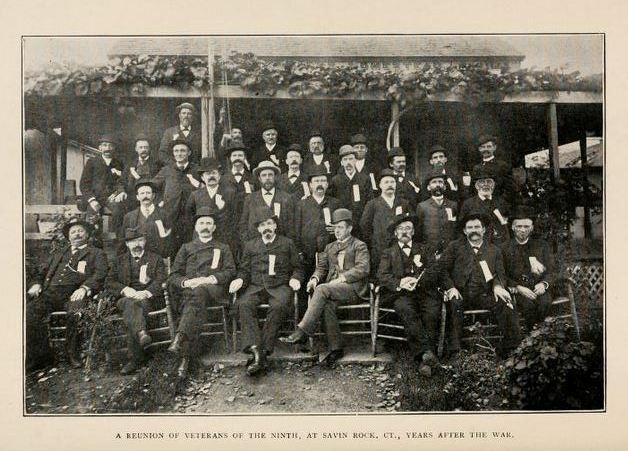 By war’s end, more than 220 soldiers of the Ninth Regiment were dead, most having succumbed to the diseases that were by far the greatest killers of the war. 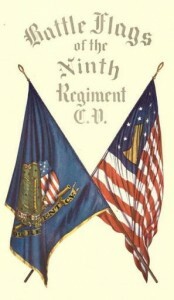 The men of the Ninth Regiment weren’t the only sons of Erin to serve in Connecticut ranks during the Civil War. More than 6,000 enlisted in other units, but the “Irish Regiment” provided the most visible testimony to the patriotism of the Irish-born, who were willing to fight and if necessary die for their new homeland. Diana Ross McCain formerly Head of the Connecticut Historical Society Research Center is the author of the books It Happened in Connecticut, Connecticut Coast: An Illustrated History, Mysteries and Legends of New England, and a biography of Connecticut’s official state heroine, To All on Equal Terms: The Life and Legacy of Prudence Crandall.